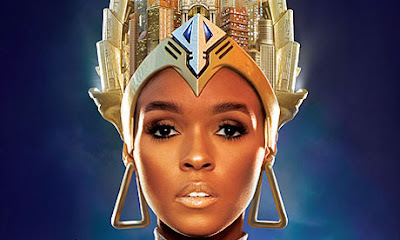 This is pretty significant considering that Janelle Monáe has virtually no airplay on any radio stations in the United States and The Guardian is the most popular site in the United Kingdom and one of the most popular sites around the world. This is quite a coup for her. The Guardian writes- Was it cerebral hip-hop? Freaked-out funk? Or an updated [Stevie Wonder's] Innervisions? There is no point trying to pigeonhole the Guardian's favourite album of 2010 – just sit back and enjoy. Here's their Top 10 album list. Guardian has also posted the album and singles list of each of their music critics. The Brits have different musical taste than us over here in the States for sure. One critic thought Ciara's Basic Instinct was the best album of the year???... and of course they love Cee Lo Green's F--- you, The Roots, and even Willow Smith. Gil Scott-Heron's new album appears on many critics' list too. But what's up with this Cassie and Nicki Minaj track called 'F--- U Silly'? Yes, the English are quite different. They don't even get hung up on using the effing "F" word on their site either?